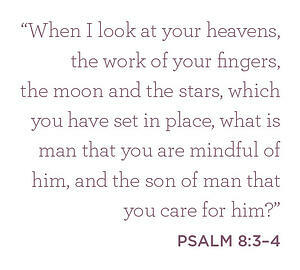 It’s interesting to contrast the psalmist’s reaction, drawn solely from what his eyes could see of the moon and the stars, with the conclusion that many draw today. Knowing what we know about the complexities of the constellations and galaxies, it’s striking that man in his unbelief continues to reject the notion of a creator. Men and women instead choose to worship the creation. The answer lies at the heart of Christianity: the Creator of the universe made us in His image for His pleasure. Because He cares for us, He stepped down into time to reconcile us to Himself for all of eternity. This is the good news that we celebrate at Christmas: “For God so loved the world, that he gave his only Son, that whoever believes in him should not perish but have eternal life” (John 3:16). This truly is the greatest story ever told! I hope you have the chance to share it with others this month. Every message in our online teaching archive can be passed for free through email and social media so that you can easily invite others to consider this remarkable and absolute truth. If you’re looking for a unique opportunity to have a Gospel conversation, our Parkside Church Christmas Concert will be streamed live for the first time this year. I extend a warm invitation to you to gather some friends together and watch any one of the three live performances where the Gospel will be clearly presented and beautifully celebrated through music. Learn more here. And finally, for the first time, our Christmas Eve worship service will also be streamed live on December 24 at 8:00 p.m. Eastern. In addition to celebrating Christmas at your home church, I invite you to join us at Parkside by going online to truthforlife.org/live. As you look upon the manger scene this season, consider Psalm 8 and affirm that the one who put the stars in the sky lay beneath them as a gift of love and mercy. My best wishes to you and your family for a blessed and joyous Christmas. P.S. Our series on the life of Joseph will conclude this month. Coinciding with the teaching about the end of Joseph’s life, you’ll find a list of recommended books that deal with end of life topics. In the event that you or someone you know could benefit, please take advantage of this collection, carefully selected by our team, by visiting truthforlife.org/hope.